Thank you all for celebrating the release of my novel, Forever Yours in Christmas Falls, which I’m excited to say hit Amazon’s Clean & Wholesome Romance and Holidays Fiction bestseller lists. Woot!! I’ve enjoyed having the special sweet romance guest authors here on my blog this past week, too. Be sure to check the bottom of the comments on their posts, where they are announcing the winners of their giveaways. 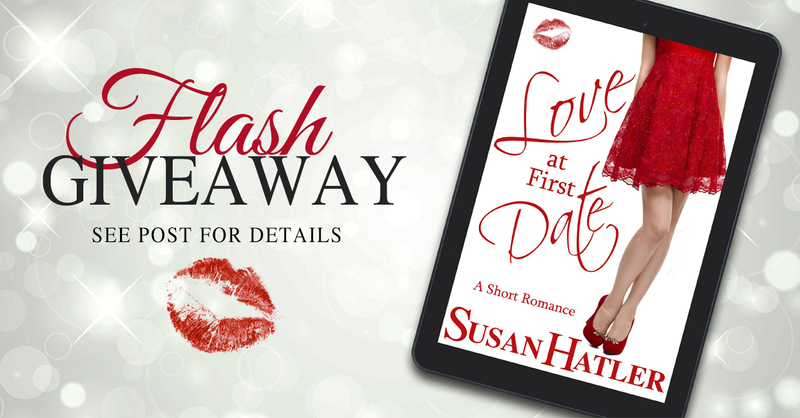 Now, I’m hosting a Flash Giveaway this week and will be giving away 2 autographed *paperbacks of Love at First Date (*US only, e-book for international). 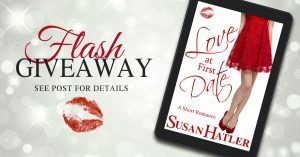 To enter this giveaway, please comment below with one of your top favorite romance novels and why you love it so much. The winner of this giveaway will be announced in the comments below next week. Good luck! Also, if you’re looking for a collection of sweet romance novellas at a low price, the Sweet Tea and Kisses collection is available on Amazon, iBooks, Kobo, and Nook. Happy reading!! Not necessarily one book, but I’ve really enjoyed Jill Shalvis’ Heartbreaker Bay series. I absolutely love regency romance stories! Edenbrooke by Julianne Donaldson is my absolute favorite. Wit, charm, romance, suspense and amazing characters. It’s my go to for a re-read and escape from reality! Yesterday’s Promise by Michelle Paige Holmes, I liked it because it is not you tipical romance. It is one that is unexpected. I loved it! I’ve always loved and reread Return To Red Castle by Dorothy Keddington! One I could (and do) read over and over again without being disappointed! It was one of the first clean romance novels I ever read, actually my sister read to me. I was hooked. I loved the characters, the plot, the flashbacks, the suspense and mystery. Everything really! And I have loved the authors other books as well! Congrats on your book being a bestseller! Very exciting. I love Jessica Patch’s romantic suspense books, but I’m not sure which one is my favorite. Her books have a strong faith message without being preachy; her characters are well developed and likable; and the plots move at a good pace. And, oh, those kisses! Congrats on your book listing of Best Seller. One favorite is awfully hard to pick since I read so many different genres and love everyone I’m reading at that moment. One is the Trade Street series by Karen White. I love everything about it. Romance, suspense,ghosts and it’s books I couldn’t put down. I could never pick just one! I love Bella Andre’s Sullivan family of firefighters and Robyn Carr’s Thunder Point series. Then there is Barbara Freethy’s family of Callaways and Susan Mallery’s Fool’s Gold series so I can not pick one as there are so many more I am adding each week! My favorite is The Lady and The Lionheart by Joanne Bischof. I love it because it’s not only a clean romance, but there’s so many amazing themes and lessons in the book. It’s amazing. I’m a sucker for regency love stories. One of my favorites is A Noble Masquerade by Kristi Ann Hunter. There’s no way I could pick a favorite – whatever book I’m currently reading tends to be a favorite, especially if it’s clean. I love so many authors and their wonderful books. I just discovered Jennifer Peel this year, and I’m enjoying reading all of her books. I pretty much like every romance book I read but right now I’d pick Edenbrooke by Julianne Donaldson. I love the wit and the era and the reality of how the romance developed. This is in my top five of favorite books to read and reread. Professional Boundaries by Jennifer Peel. I love it because I feel so much for the characters. And no matter how many times I read it those same feelings come each and every read through. I can’t pick a favorite as I have many I re read. I have probably read more Robyn Carr books because love her characters. It’s very hard to pick just one. I love all of Robyn Carr’s books. Susan Gallery’s Fools Gold series also. Thank you for the chance. I do love to read, and it depends at the time I’m choosing a book what my mood is..I do like Cynthia Eden’s series, Susan Mallory’s series, Sharon Sala series, I’m liking D’Ann Lindun’s Cowboy books they have so many I do enjoy so many to choose..
For the Love of Sami by Fayrene Preston. I couldn’t stop laughing!!! Loved “A Very Married Christmas: Silver Bell Falls” by Samantha Chase. A wonderful love story with all trappings. Mine was love bites by lysany sands. Read it on a plane and shot soda from my nose. The guy next to me..took it home to his wife. So many to choose from, but my favorite tight now is Thicker Than Water by Dylan Allen. It was a love story about two people who weren’t supposed to be together, but couldn’t fight that instant attraction. It was beautifully written and took on some hard topics so well. It was just so good. I so love your writing kudos and a great giveaway. I love sharon Sala , D’Ann Linden and so many more. Sweet Vengeance is my new fave. It’s got steamy, suspense, scandal and all the twists and suspense I crave. My favorite romance novel is The Notebook by Nicholas Sparks. Love the movie too! I enjoy Any and everything by Debbie Macomber. Her rose harbor series is my favorite. Bella Andres San Francisco Sullivan’s series. Because their all successful and down to earth. Their beautiful people inside and out and I love their mother. She’s a wonderful and amazing person. Love this series. Really enjoyed Sweet Tea and Kisses! I love books set in the South! A favorite romance, that I like to re-read, is A Dundee Christmas by Brenda Novak! Right now, my favorite book is A Broken Kind of Beautiful by Katie Ganshert. This book makes me feel everything and the character as so authentic and real. It’s safe to say, it gave me a serious book hangover. Still my favorite, the classic Pride and Prejudice, love the writing of Jane Austen and the characters! My all time favorite is A Knight in Shining Armor by Jude Deveraux. Such a well written book, great plot, and wonderful characters. I have read this book many times over the years. The best romance that sticks with me is the Born In series by Nora Roberts. I just really connected with this series and each female had their own obstacles to overcome to find happiness. And the women were strong and determined. I have a hard time with damsels in distress. The women shouldn’t always need to be saved, they should be able to handle their own in certain circumstances. My favorite books are from Cora Seton Chance Creek Cowboys series. I love the family oriented and fun series. I am enjoying the First Street Church series. It is ongoing and many different authors are participating. Thank you for this chance to win one of your lovely books.